Originally published under the title, "Iran as Regional Hegemon: Tehran's Success and Riyadh's Failure." The Saudis were shocked when the U.S.-led P5+1 world powers signed an interim nuclear agreement with Iran in November 2013. 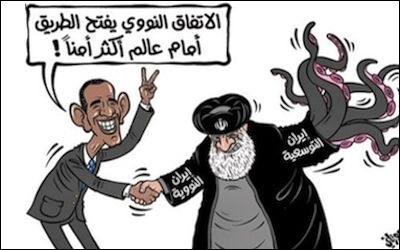 "The nuclear agreement will open the way for a safer world," Obama tells the multi-tentacled terror sponsor in this Al-Watan cartoon. The arm shaking hands has "nuclear Iran" written on it; the other says "expansionist Iran." Each for its own reasons, the world's major powers have decided to accept Iran as a regional hegemon, I wrote March 4 in Asia Times, leaving Israel and the Sunni Arabs in isolated opposition. The global consensus on behalf of Iranian hegemony is now coming clearly into focus. Although the motivations of different players are highly diverse, there is a unifying factor driving the consensus: the Obama administration's determination to achieve a strategic rapprochement with Tehran at any cost. America's competitors are constrained to upgrade their relations with Iran in order to compete with Washington. Despite Iran's intentions to dampen sectarianism, build responsive partners, and deescalate tensions with Saudi Arabia, Iranian leaders—particularly within the security services—are pursuing policies with negative secondary consequences for regional stability and potentially for Iran. Iran's actions to protect and empower Shia communities are fueling growing fears and sectarian responses. Iran supposedly is doing its best to "dampen sectarianism, build responsive partners, and deescalate tensions with Saudi Arabia" — complete and utter falsehood. Iran is infiltrating Saudi Arabia's Shi'ite-majority Eastern Province (also its most oil rich) to agitate against Saudi control, and sponsored a coup against a Saudi-allied regime in Yemen. The report attributes nothing but good intentions to the Tehran regime, and worries only that its policies will have "negative secondary consequences" due to its (understandable, of course) efforts to "protect and empower Shia communities." Iran's primary motivation, in the administration's view, is to be a good neighbor and a fountain of good will. Neville Chamberlain never said such nice things about Hitler. Iran's primary motivation, in the administration's view, is to be a good neighbor and a fountain of good will. A sign of Saudi Arabia's waning influence was Pakistan's decision March 15 to refuse a Saudi request for Pakistani troops to deploy on its border with Yemen, now controlled by pro-Iranian Houthi rebels. A senior Pakistani official told the local press, "Pakistan would not rush to join the anti-Iran alliance that is being forged," in the wake of Pakistani Prime Minister Nawaz Sharif's visit to Saudi Arabia last week. "We cannot afford to involve ourselves in the disputes among the Muslim countries," the official said, adding that Pakistan could spare no additional troops for Saudi Arabia. Pakistan has long had a close relationship with Saudi Arabia and has been involved in protecting that country and the House of Saud. Pakistan has much friendlier relations with Iran than Saudi Arabia does, but ultimately it is more dependent on Saudi Arabia. Saudi Arabia, for example, gave oil to Pakistan in 1998 to help Pakistan weather international sanctions against it for conducting a nuclear test. The Saudis also saved Nawaz Sharif after he was overthrown in a coup in 1999, and he is thus beholden to them. Pakistan may have been Saudi Arabia's best bet, but it is a bet that has not paid off. Pakistan is not beholden enough, it appears: Pakistan also is beholden to both the United States and China. The right question to ask is whether Washington intervened with Pakistan to block the Saudi proposal. And China, as I reported in my March 2 analysis, has decided that Iranian regional hegemony is the least bad alternative for the time being. China's overriding concern is the security of its energy supplies, and it wants to avoid a full-dress Sunni-Shi'ite war in the region. Until early 2014 China thought it could rely on the United States to guarantee energy security in the Persian Gulf. With America's strategic withdrawal from the region and the rise of ISIS, China has found itself without an American guarantee and without the resources to assert its own security interests. China's shift towards Iran reflects these considerations. The rise of the Islamic State in Iraq and Syria has thus emerged as a new component of the Chinese security calculus. Beijing is worried that the rise and spread of Sunni militant Islam so close to its borders, including neighboring former Soviet "Stan" countries of Central Asia, will kindle radical elements in Xinjiang. Sunni militant Islam also threatens to become a strategic and an ideological nightmare for China's massive and unprecedented multi-billion dollar investments from Xinjiang westward across Central Asia, the linchpin of Beijing's future vision of energy security and economic development. Sunni radicalism could hinder, if not derail, the realization of Beijing's Silk Road Belt initiative, presenting a major obstacle to building out a vast overland transcontinental transportation and energy infrastructure. In an effort to maintain stability in Xinjiang, China has set about strengthening ties with Turkey. But this is no easy task. According to a Pew Research Center poll published last July, Turkey has the most unfavorable view of China amongst the Middle Eastern countries surveyed, with 69 percent of Turks expressing a negative opinion of China, and 57 percent saying that China's growing economy is not good for Turkey. And so China gravitates increasingly towards Iran, which it believes can act as a buffer zone against the eastward advance of Sunni radical Islam. Reality is a bit more complex: China envisions Turkey as a terminus for the "One Belt, One Road" initiative, but it also rankles at covert Turkish support for Chinese Uyghurs. Contrary to Nash and Akhlaghi, China will continue to balance relations between Iran on the one hand and the Saudis and Turks on the other, but it does not want to confront Iran at a moment when Iran provides an important counterweight to ISIS in Iraq, a growing source of Chinese oil imports. Washington's embrace of Tehran has made Iranian regional hegemony the path of least resistance for others. If militant Sunni Islam is an important (if not dominant) concern for China, it is a primary concern for both India and Russia. Russia's problems in the Caucasus lie with Sunni rather than Shi'ite Muslims. ISIS' success has inspired copycat terrorists in Russia such as the Caucasus Emirate. An estimated 2,500 Muslims from Chechnya and elsewhere in the Caucasus have joined ISIS, and ISIS has declared its intention to "liberate" the Caucasus from Russian control. Russia warned the West a year ago that it would align with Iran to punish the West over the Ukraine conflict. For India, an increase in Iran's influence represents a distraction for its main opponent Pakistan, which is 80% Sunni and shares a border with Iran in fractious Baluchistan. India may not relish the prospect of Iran as a nuclear power, but it has no more sense of urgency about this than does Israel about North Korean nuclear weapons. China does not want a nuclear arms race in the Persian Gulf, but it needs time to develop a policy response independent of the United States. Washington's embrace of Tehran has made Iranian regional hegemony the path of least resistance. For the time being, it's Iran's show.